Discussion in 'Prime Main Forum (2017-Current)' started by Rieuk, Mar 22, 2019. Came out of a driveway at a bad angle and the rear wheel stepped off the curb. 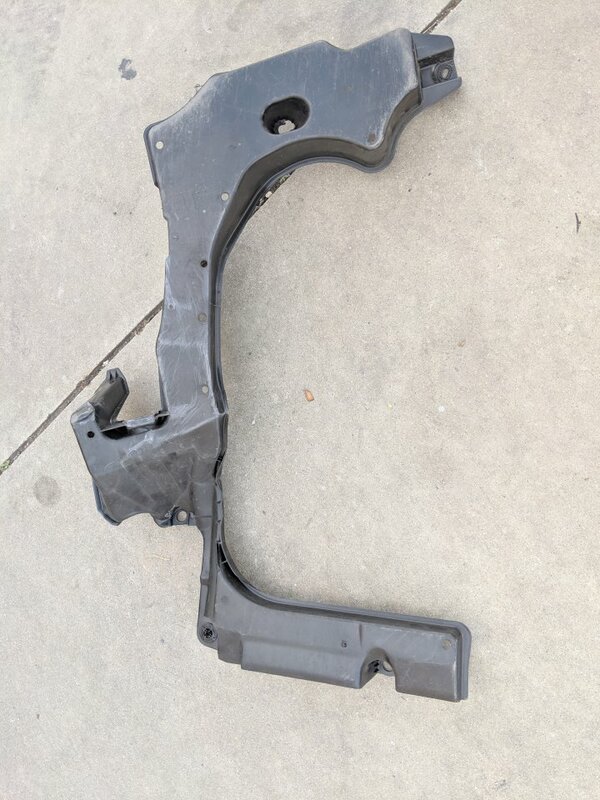 The belly pan/cover (I think it's made of some plastic) got scraped and part of it ripped off the fasteners (the rear part). What's the best way to go about repairing this kind of thing? I am still under Toyota care (14 months of ownership, 13300 miles). Should I go to the dealership or will they price gouge me? Should I order the part on my own? What should I do in the mean time (it's dragging on the floor)? Once you have the part number, you can price match to other online Toyota dealers. I did that with my interior and trunk all weather mats with no issues. Montgomery and kevin.c like this. Here's a video of a guy using the technique to repair a bumper. Nice and visible for the camera. You won't need to be as precise, fixing a splashguard. Use the black outdoor-grade zipties so you don't have to repeat the work after a few years of UV damage. kevin.c and jerrymildred like this. Similar thing happened to me, only the thing didn't rip. Half of it was hanging down. Had to pull the whole thing off to prevent dragging on the pavement. Went to dealer who said they could not re-attach it. They said I should go to a body shop for repair. Luckily/unluckily my wife had a fender bender. When we went in for repair, the body shop re-attached the thing for free. I love my Prius but the ground clearance is definitely too little. Thanks for the replies. I've put up pictures of the part that's hanging off. Any idea how I can identify the part number? Also regarding the zip tie repair - I would need to get under there somehow...probably would need to head to a body shop? Go see the parts guy at the Dealership. They will break it down with illustrations , part numbers and costs. Montgomery and Leadfoot J. McCoalroller like this. Well you are near me. And I do visit my astronomy professor from time to time. It is obvious that you can't drive it with that part dragging on the ground. 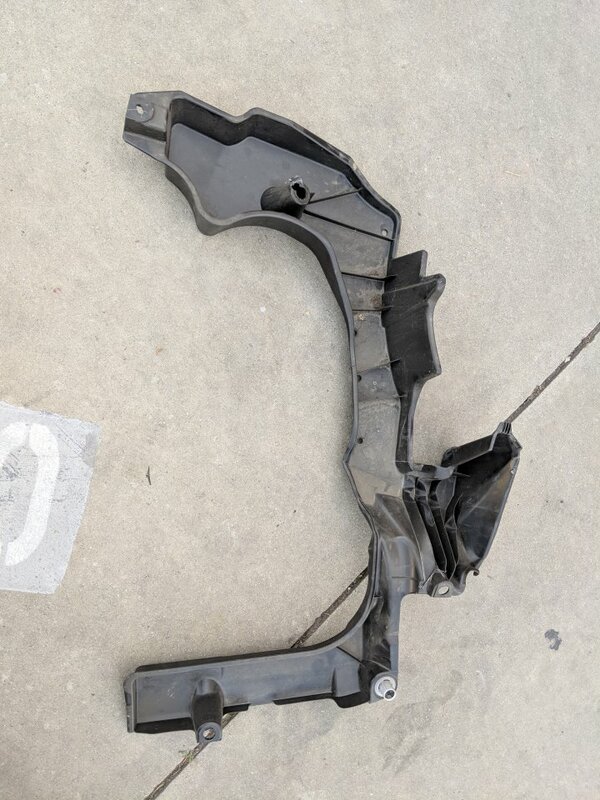 If it were mine, I would jack up the rear driver side of the car, remove the tire so you can get at the part easier, and either remove it or reattach it so it doesn't hang down, and then see the dealer about a replacement part. If the issue is just the fasteners as it appears to be, many of those can be found at hardware stores now. Last time in need, I found the required ones at Lowes. But honestly, I'd just leave the fix at zipties for that piece since it isn't one you'll need to remove regularly; maybe duct tape to smooth over cracks if the wind noise was bad. 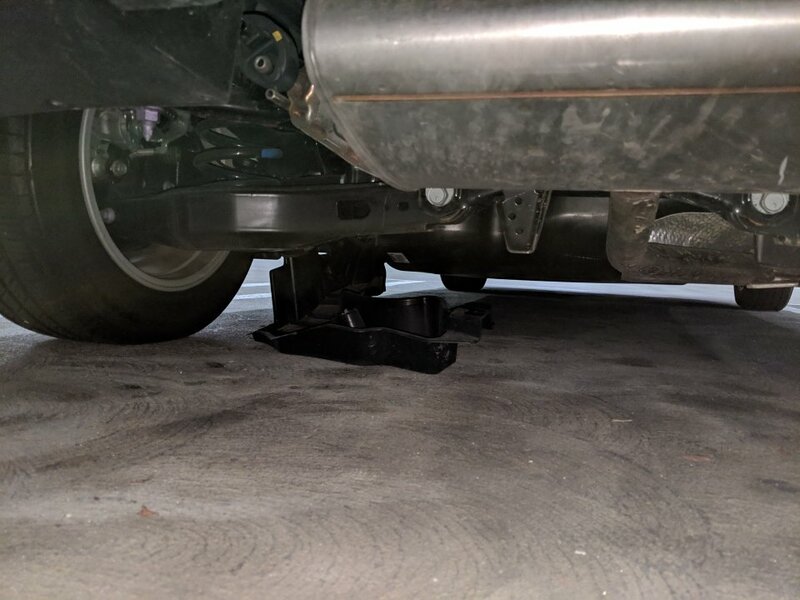 If you actually have to crawl under the car for the fix, you'll need a jack stand. Wide pieces of scrap lumber stacked up can also work, along with a spare tire. Even the Prime wheel will work, but you'll have to protect the face. If you have the wherewithal, run it up on ramps or raise with a floor jack and put in safety stands. Those plastic pieces usually have the part number embossed big-and-bold. There may be missing fasteners as well. Compare right and left side. If it's a minor crack you might be able to repair by applying some fiberglas mesh on the back and using 2 part epoxy. Or lap the crack with some strips of plastic, then 2 part epoxy. Or ABS glue? Test the latter first. I have fastening tools and a drill, though. Sometimes you can find the right curb or pothole to create enough work space when you park the car over it. scona, Montgomery and Trollbait like this. So an auto repair shop kindly dismantled it for free. Attached photos. I can see how this thing would catch very easily especially considering that the car is low. What's the best way to go about repairing this kind of thing? Should I order the part on my own? I’d buy the parts and pay an independent shop to install them. If there isn’t any damaged sheet metal, you don’t need a body shop; any garage with a lift should be able to do the work. Be sure to have them look carefully under the car for other damage, since the cover is right next to the fuel tank. This would cost less than having a dealer do the work, and it also avoids making a record in Toyota’s systems that the car was damaged and repaired. Neither the warranty nor Toyota Care covers accidental damage. Your auto insurance policy might have coverage, but if the damage was only to the cover and its fasteners, the loss may not exceed the deductible. Any idea how I can identify the part number? 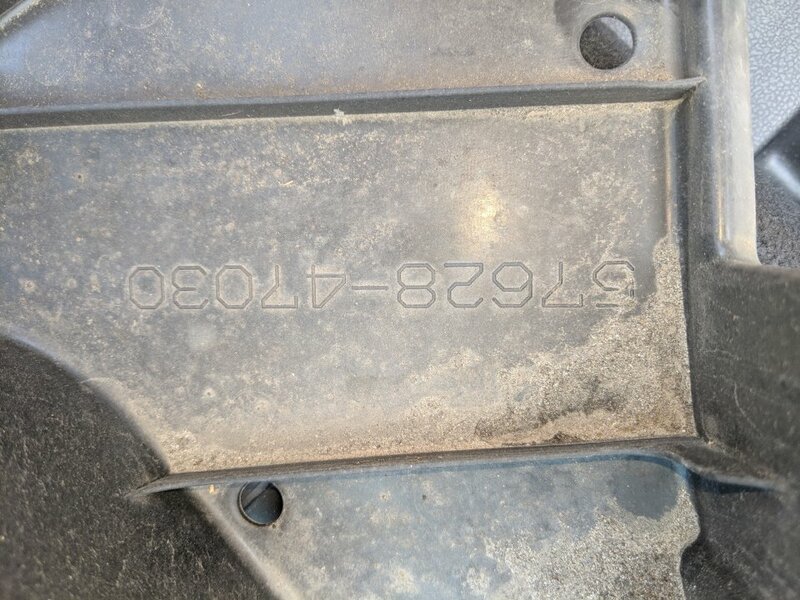 It’s not true for every part, but in this case, the production part number seen in your photo (57628-47030) is also the service part number, as shown in parts catalog Figure 58-01, Floor Pan & Lower Back Panel, which calls it the Left Rear Floor Side Member Cover. 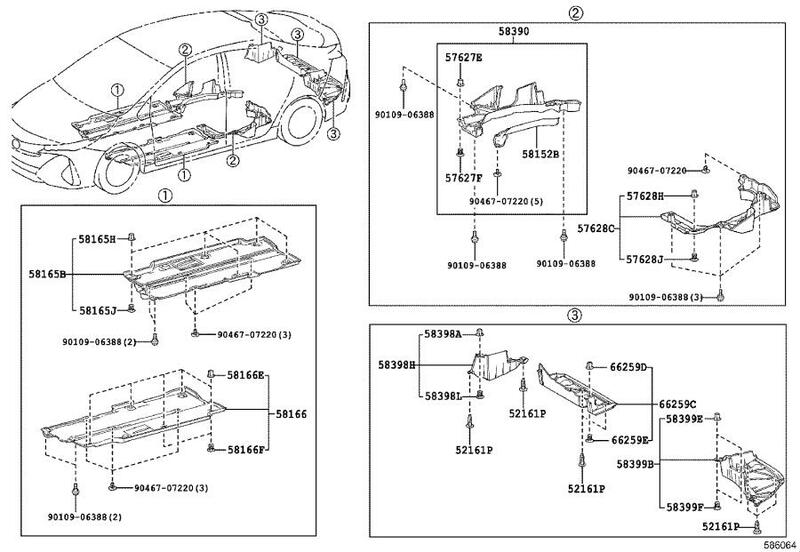 The images on parts.toyota.com are broken again, but an older version of the illustration shows that the part comes with one 90467-17026-A0 white clip and one 90467-17027-C0 black clip. You’ll also need one 90467-07220 push-in black clip and three 90109-A0061 (formerly 90109-06388) bolts, sold separately. The Repair Manual (more info) says the torque specification for the bolts is 7.5 N·m. Norwalk Toyota offers the covers online for $111.42 plus tax and shipping. You may be able to order online to get the discounted price and then pick up the part in person, if you’d rather not pay for shipping. Mendel Leisk and Chazz8 like this. Are you saying that you do not know that your car came with a jack? did they give you any of the fasteners when they removed it?? it looks to me like its mostly intact. can totally reuse it. its just a crappy cover for the underbody, i would go buy some zip ties, and reuse some of the old fasteners. can run up on a nice curb somewhere and have enough room to figure out how to reattach it. it looks weird. it will take you longer to figure out how it goes up onto the body than it will take to slip the zip ties in and snip them. or save the part and next time you get the car inspected (not at the dealer) ask them to zip tie it back on. they will probably do it for free. worst case leave it off, if its not visible. i highly doubt it is doing anything functional on the underbody just scrape protection. but i rather scrape up the metal, than scrape off plastic panels that are flimsy and then hang off and need to be reattached. Montgomery, Leadfoot J. McCoalroller and Mendel Leisk like this. Yes, consider just gluing the pice first, with some sorta backer, fiberlass mesh, plastic strips, as needed. 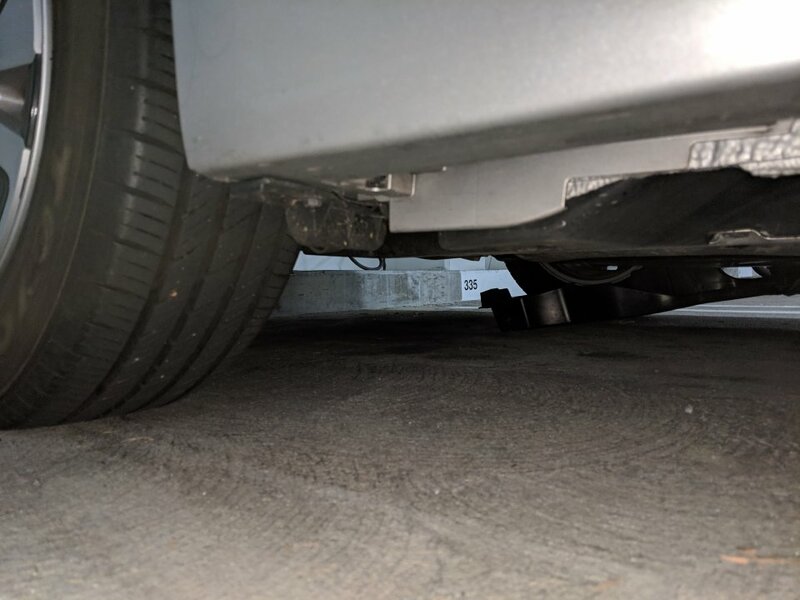 Anyone install a Curb-Alert front bumper parking sensor? Will Intelligent Clearance Sonar ICS detect roadside curb?